Actors including Sir Derek Jacobi and Mark Rylance have lauched a debate over who really who wrote William Shakespeare’s works. Almost 300 people have signed a “declaration of reasonable doubt”, which they hope will prompt further research into the issue. “I subscribe to the group theory. I don’t think anybody could do it on their own,” Sir Derek said. The group says there are no records of Shakespeare being paid for his work. 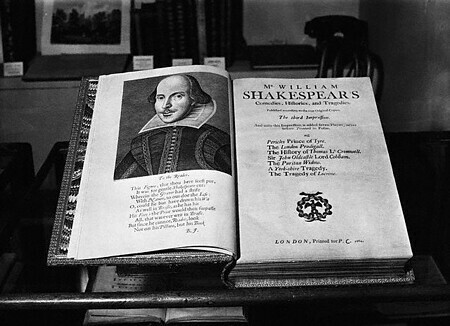 While documents do exist for Shakespeare, who was born in Stratford-upon-Avon in 1564, all are non-literary. In particular, his will, in which he left his wife “my second best bed with the furniture” contains none of his famous turns of phrase and it does not mention any books, plays or poems. The 287-strong Shakespeare Authorship Coalition says it is not possible that the bard’s plays – with their emphasis on law – could have been penned by a 16th Century commoner raised in an illiterate household. It asks why most of his plays are set among the upper classes, and why Stratford-upon-Avon is never referred to in any of his plays. “How did he become so familiar with all things Italian so that even obscure details in these plays are accurate?,” the group adds. Conspiracy theories have circulated since the 18th Century about a number of figures who could have used Shakespeare as a pen-name, including playwright Christopher Marlowe, nobleman Edward de Vere and Francis Bacon. “I think the leading light was probably de Vere as I agree that an author writes about his own experience, his own life and personalities,” Sir Derek said. The declaration, unveiled at the Minerva Theatre in Chichester, West Sussex, also names 20 prominent doubters of the past, including Mark Twain, Orson Welles, Sir John Gielgud and Charlie Chaplin. A copy was presented to Dr William Leahy, head of English at London’s Brunel University and convenor of the first MA in Shakespeare authorship studies, to be launched later this month.